You can keep bed bugs off your mattress with the LINENSPA Zippered Encasement Breathable Mattress Protector. This affordable product comes in every mattress size, including Twin XL, Full XL, and California King, and it provides 360-degree protection for your bed. This thin, waterproof mattress cover is made from vinyl-free material and can fit on mattresses up to 12 inches deep. It fully encases your mattress and has a zippered closure to form a barrier against bed bugs, dust mites, and allergens. Plus, the material is soft and breathable, and it won’t cause any crinkling during the night—you’ll barely even notice it’s there! When it gets dirty, you can simply toss the cover in the washer and dryer for easy care. Reviewers highly recommend this mattress protector, saying it’s high-quality and keeps bed bugs out. Many also use it on their children’s mattresses, as the waterproof barrier keeps the mattress from getting ruined if they ever have accidents. Another top-rated bed bug mattress protector is the Utopia Bedding Zippered Mattress Encasement. This product comes in all standard sizes, and it completely encloses your mattress, effectively keeping bed bugs at bay. This mattress encasement is made from thick knitted polyester fabric that’s waterproof and hypoallergenic. It’s free from vinyl, PVC and other toxic chemicals, and it can be used on mattresses up to 13 inches deep. The zippered cover provides 360-degree protection, and this model even includes a “zip guard” to ensure it doesn’t accidentally open, giving access to bugs. Reviewers say this mattress protector is high-quality, and many have stories about how this product helped them get rid of bed bugs. The only downside is that the cover does make some noise, which can be annoying as you shift during the night. Want to take a look at some other options? See our guide to the best bed bug sprays. For an inexpensive mattress cover, you may want to consider the Ultimate Guardian Bed Bug-Proof Mattress Protector. It comes in every size, and it’s even laboratory tested to ensure no bugs will get through. This mattress cover is made from a cotton-polyester blend, so it doesn’t feel like plastic. It surrounds your mattress on all sides, and it’s waterproof, as well, making it a great option for kids. You can wash this product on the gentle cycle, but it’s recommended that you air dry it. 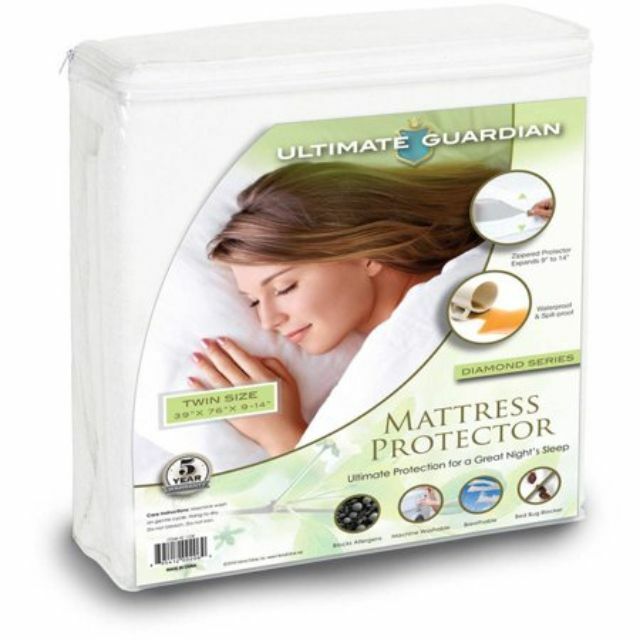 Reviewers say the Ultimate Guardian Mattress Protector is a great value, as it’s high-quality and quiet when you move around. However, some note that it gets a little warm during the night and might not fit on thick pillow top mattresses. If your child is heading off to live in a college dorm, you might want to send a mattress protector with them—you never know what bugs might be hiding on those mattresses. The Four Seasons Essentials Twin Extra Long (XL) Mattress Protector is a great option for college kids, as it will protect the extra long mattress from bed bugs, dust mites, spills, mold, mildew and more! This mattress cover is a six-sided zippered encasement that will fit on any mattress between 9 and 16 inches deep. The breathable polyester fabric won’t get warm during the night, and it’s designed to be smooth and noiseless under your sheets. It even features a Velcro zipper seal system with tie downs to prevent the zipper from coming open. You can clean this mattress cover in the washer and dryer, and reviewers say the product is well made and easy to put onto your bed. To ensure it will provide unbeatable protection against bed bugs, some mattress covers are put through lab testing. If you want a product that’s been lab-certified, check out the SafeRest Premium Zippered Mattress Encasement, which is available in most mattress sizes and a variety of depths. This mattress encasement is made from cotton terry that makes it cool and noiseless, and it surrounds your mattress completely on all six sides. It even includes micro-zipper technology to ensure bugs can’t crawl through the teeth, as well as a secure zipper closing with a velcro flap. The product has been independently lab tested and certified, ensuring it prevents against bed bug entry and escape and that it is bite proof. Reviewers say the SafeRest mattress cover has a bit of a chemical smell at first, but it goes away once you wash it. Pillow top mattresses are often quite thick, and you may have trouble fitting a standard mattress cover over them. If you have a deep mattress, you’ll need a product like the SureGuard Mattress Encasement, which can fit on mattresses up to 20 inches deep. This cover is made from cotton to provide a soft, noiseless experience. It includes a super-fine zipper and SureSeal technology to completely seal off the mattress from bed bugs, and it also blocks common allergens like dust mites and pollen from getting into your mattress. You can wash and dry the cover in your home machine, and there’s a 30-day money back guarantee if it doesn’t work for you. Reviewers say you can’t even tell the cover is there when you’re sleeping and that the extra bed bug protection features are worth the price. Mattresses aren’t the only place bed bugs can hide. If you’re recovering from an infestation, you’ll need to protect your box spring, as well. Luckily, there are affordable box spring encasements such as this option from Utopia Bedding, which fits box springs up to 10-inches deep. This cover is made from polyester knitted fabric, and it’s waterproof, durable and tear-resistant. It includes a mini zipper, as well as a zip guard, to ensure bed bugs can’t get through it. Plus, it’s hypoallergenic, keeping allergens out of your box spring. Reviewers say it fits perfectly and works great, but some do note it’s a bit hard to get onto your box spring alone. Finally, don’t forget to protect your pillows—seriously, bed bugs will hide just about anywhere. This two-pack of SureGuard Pillow Protectors will ensure there are no creepy crawlies where you rest your head, thanks to their waterproof, bed bug-proof design. These pillow encasements are made from cotton terrycloth, so they’re comfortable to sleep on and won’t make noise as your shift. The cases have a super fine zipper with Invisi-Zip technology that completely seals off your pillow from bed bugs, dust mites, and other allergens. Reviewers love that the zippers are so secure, and many say they’re incredibly comfortable to sleep on. Need to invest in some new pillows for your bed? Check out our list of the best places to buy pillows.